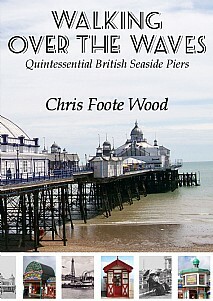 In 2007, author and broadcaster Chris Foote Wood achieved a lifelong ambition - to visit every seaside pier in England, Wales and the Isle of Man - all 56 of them! This odyssey, plus copious research, has provided the raw material for Walking over the Waves. In words and pictures, Chris describes in fascinating detail the history, the personalities, the stories and legends and the present condition of this very British institution, the seaside pleasure pier. Read about how they were built and who built them, the storms, shipwrecks and fires that hit our piers and sometimes destroyed them, and the stars who performed or still perform on them. From the longest pier to the shortest, the oldest to the youngest, the finest to the most mundane, they are listed. "Each pier is different, with its own individual personality," Chris enthuses, "some piers are still much as they were when they were built in the Victorian and Edwardian eras, while others are wholly given over to entertainment and modern amusements. Most are a mixture of the two". "Seaside piers appeal to all ages, all generations and most nationalities. Piers offer a complete range of enjoyment and satisfaction - there's something about a pier, stretching out over the water, that has universal appeal. Enthusiasts appreciate a pier's form and structure, while most holidaymakers are more concerned about the facilities on offer. Some are content to stroll along the pier deck, enjoying the benefits of fresh air, exercise and views over the sea while others immerse themselves in the amusement arcades and funfairs that are a major feature of most of our remaining seaside piers. Food, drink and entertainment are all the more enjoyable when taken 'over the waves'." As well as the piers themselves, Chris describes the pier railways - a welcome facility on some of the longer piers - and their associated cliff lifts. As a bonus, the multitude of facts and information make and ideal quiz - questions and answers are provided! A fascinating book which reveals everything one might want to know about the piers still around the coasts of England and Wales. It will be of immense appeal not only to anyone living at the seaside, but also to those with an interest in our maritime history and would be an ideal companion when visiting the seaside or reading at home.